Home | Serigraphs and Giclee Fine Art | John Kiraly | John Kiraly Limited Edition Serigraph on Paper: " Temple of the Swim "
John Kiraly Limited Edition Serigraph on Paper: " Temple of the Swim "
Image Size: 32" x 41"
About the Art: John Kiraly's paintings depict a delightful mix of illusion and reality. Vibrant tropical foliage, the colors and feel of the Mediterranean and Caribean climate, and architecturally-exquisite buildings in Latin and classical style evoke dreams of pleasure and serenity. Kiraly's inspiration comes from the splendor he has seen during travels around the world and from his appreciation for beauty, both natural and man-made. Raised primarily in Florida, he enrolled at nearby University of Miami on a full art scholarship and eventually left the classroom to travel the world. He explored Europe, Central and South America before settling for seven years in Bahamas, where he opened his own gallery. To develop his eye for painting natural elements, Kiraly returned to the United States and spent a year on a Midwestern farm, experimenting with abstract collages made of leaves, seeds and plants. 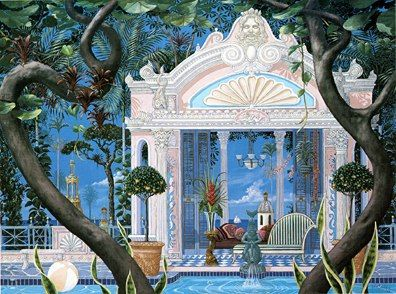 Moving to the island of Key West, Florida in 1973, Kiraly began to paint studies of buildings and tropical plants that eventually led him to paint exquisite landscapes. Kiraly has been honored with numerous solo and group exhibitions, juried shows, television specials and feature articles. His works are in distinctive corporate and private collections, most notably those of numerous well-known actors. Home | Fine Art Prints & Limited Editions | Gallery Direct Art is your Authorized Chalk & Vermilion Dealer | John Kiraly | John Kiraly Limited Edition Serigraph on Paper: " Temple of the Swim "